Enter charm choices here. If you selected "No Charms" enter NONE in the text box. A 3/4 inch oval is engraved with the words 'dog mom'. Each bangle is hand formed from thick, heavy gauge wire and then hand-hammered and tumbled for shine and strength. 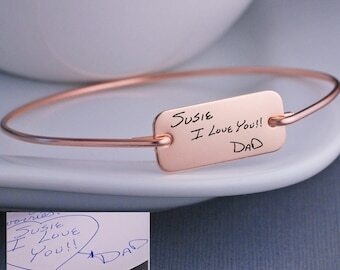 Available in 14k rose gold filled, 14k gold filled, and sterling silver band with a stainless steel disc. ***The listing is for the bracelet. 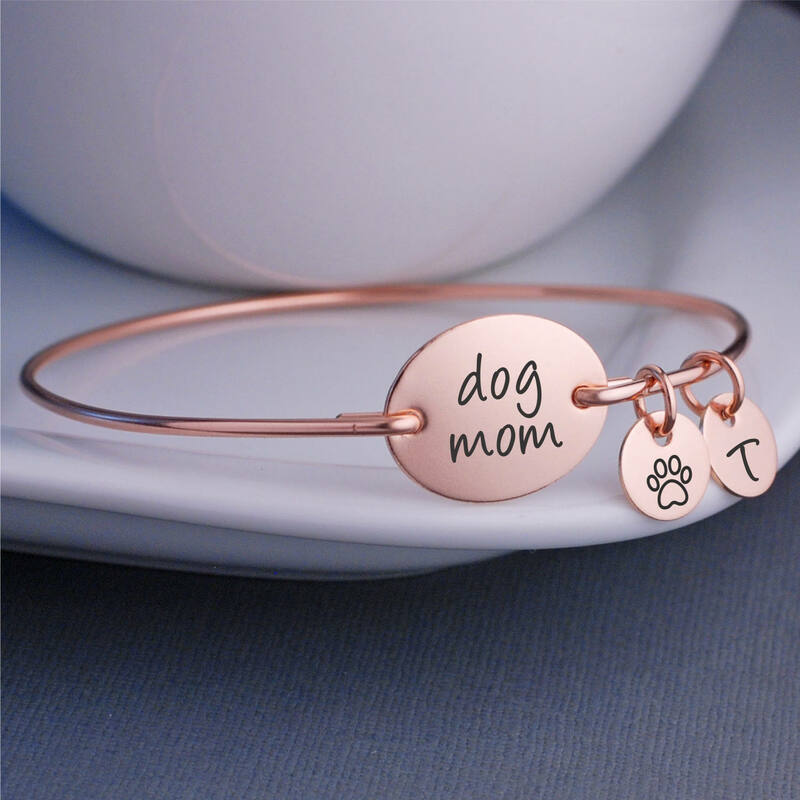 ALL charms are optional (paw and initials shown are optional). Choose the quantity in the drop down menu and leave a note in the text box. Let me know if you have any questions at all and I will promptly respond. Upgrade to Premium Gift packaging to include a Sparkle and Shine jewelry cleaning stick & gift note along with our signature box and bow. Very cute bracelet! Arrived very quickly! I love it! Love the bracelet, excellent quality, shipped out fast. All items arrive in a gift box! If it is being sent directly to someone as a gift and you need a brief gift note included, just let me know in the notes at checkout. When will I receive my international package? International shipping times vary depending on your country. It typically takes 2-3 weeks can take up to 4 weeks due to customs delays. Occasionally longer. If you need it faster contact us for upgraded shipping. Can you resize a bracelet if it doesn't fit? Yes! If you purchase a bracelet and it doesn't fit, we can resize it! Instructions come inside the box. Unfortunately, rings cannot be resized. Check your ring size with your local jeweler before ordering. Can I purchase a bracelet now and exchange it after Christmas? Absolutely! Any Christmas gifts purchased now can be exchanged through January 31, 2019.